How do viruses that cause chronic infections, such as those caused by HIV or hepatitis c virus, manage to outsmart their hosts' immune systems? The answer to that question has long eluded scientists, but new research from McGill University has uncovered a molecular mechanism that may be a key piece of the puzzle. The discovery could provide new targets for treating a wide range of diseases. Fighting off infections depends largely on our bodies' capacity to quickly recognize infected cells and destroy them, a job carried out by a class of immune cells known as CD8+ T-cells. These soldiers get some of their orders from chemical mediators known as cytokines that make them more or less responsive to outside threats. In most cases, CD8+ T-cells quickly recognize and destroy infected cells to prevent the infection from spreading. "When it comes to viruses that lead to chronic infection, immune cells receive the wrong set of marching orders, which makes them less responsive," says Martin Richer, PhD, an Assistant Professor at McGill's Department of Microbiology & Immunology and senior author of the study, published online on January 23, 2018 Immunity. The article is titled “Interleukin-10 Directly Inhibits CD8+ T Cell Function by Enhancing N-Glycan Branching to Decrease Antigen Sensitivity.” The research, conducted in Dr. Richer's lab by graduate student Logan Smith, revealed that certain viruses persist by driving the production of a cytokine (IL-10, image shown here) that leads to modification of glycoproteins on the surface of the CD8+ T-cells, making the cells less functional. That maneuver buys time for the pathogen to outpace the immune response and establish a chronic infection. Importantly, this pathway can be targeted to restore some functionality to the T-cells and enhance the capacity to control infection. Ants, like humans, deal with disease. To deal with the bacteria that cause some of these diseases, some ants produce their own antibiotics. A new comparative study identified some ant species that make use of powerful antimicrobial agents - but found that 40 percent of ant species tested didn't appear to produce antibiotics. The study has applications regarding the search for new antibiotics that can be used in humans. The paper, "External Immunity in Ant Societies: Sociality and Colony Size Do Not Predict Investment in Antimicrobials," was published online on February 7, 2018 in the journal Royal Society Open Science. "These findings suggest that ants could be a future source of new antibiotics to help fight human diseases," says Clint Penick, PhD, an Assistant Research Professor at Arizona State University and former postdoctoral researcher at North Carolina State University, who is lead author of the study. 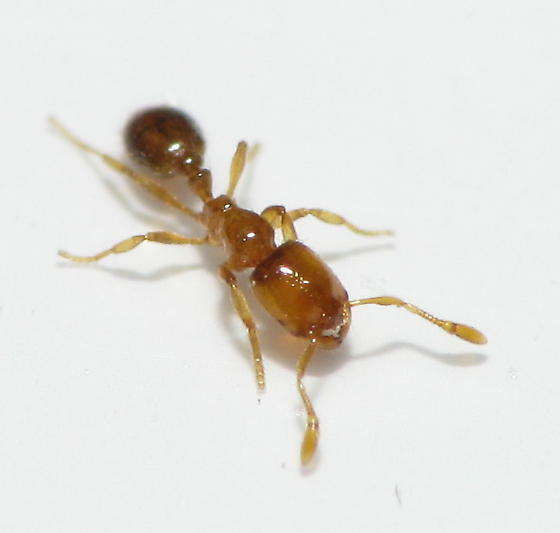 "One species we looked at, the thief ant (Solenopsis molesta) (photo), had the most powerful antibiotic effect of any species we tested - and until now, no one had even shown that they made use of antimicrobials," says Adrian Smith, PhD, co-author of the paper, an Assistant Research Professor of Biological Sciences at NC State and head of the NC Museum of Natural Sciences' Evolutionary Biology & Behavior Research Lab. "But the fact that so many ant species appear to have little or no chemical defense against microbial pathogens is also important,” Dr. Penick said. That's because the conventional wisdom has long been that most, if not all, ant species carry antimicrobial agents. But this work indicates that the conventional wisdom is wrong. "We thought every ant species would produce at least some type of antimicrobial," Dr. Penick says.